Cyclades is the most famous cluster of the Greek islands. Some of the prettiest islands in the world are in this complex. The famous Santorini is a world natural wonder of remarkable beauty and unique architecture. It is essentially the remains of a volcanic eruption in 16th Century BC which destroyed the island and created the current geological caldera. Today is famous for the breathtaking sunset from Oia, wine cellars and wine tasting, caldera walks and one of the best seaside views in the world. Another popular destination is Mykonos. It is Greece’s most cosmopolitan island. Rich & famous from all over the world visit this vibrant island every year. Particularly known: for the exciting nightlife, the picturesque Cycladic architecture and the magnificent golden sand beaches. 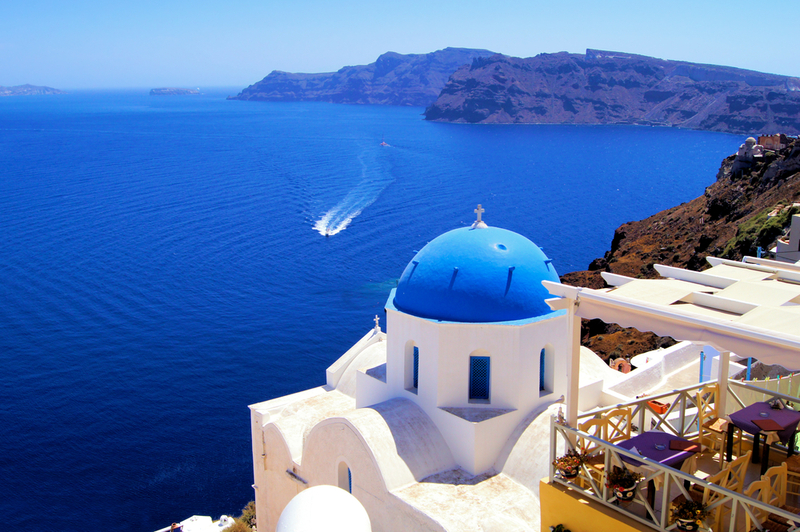 Itâ€™s a must visit island while you cruise on the Cyclades. Cyclades islands are much more than Mykonos & Santorini. Milos is another beautiful island of the complex known as the Lovers island. The island got the name after the famous statue of Aphrodite, the ancient Greek Goddess of love, found in 1820, now located in the Louvre museum in Paris. The statue is also known as the Venus de Milo. In this island you will enjoy 80 amazing beaches with your better half, friends & family, among them stands out Kleftiko with its turquoise waters and Sarakiniko with white sharp rocks cutting deep into a sheer cliff; add the unique lunar landscapes, the rocky secluded caves, the mysterious catacombs, the sleeping volcanoes and a picturesque Cycladic Chora and experience a unique version of romance! For those seeking tranquility, mystery & nature, lesser Cyclades or small Cyclades will astonish you. Between Naxos and Amorgos there are some small islands with a fantastic crystal clear waters of blue and turquoise, among this network of tiny islands, Donoussa, Pano Koufonissi, Schinoussa and Iraklia, are the only populated. Locals are friendly and hospitable, always ready to tell the stories of the past and the beauty of the place that makes these Greek islands unique among the rest of the Aegean. These tiny islands are ideal for snorkeling and hiking. They are so small you can literally swim or walk around them. There are paths that lead to mystical places, delicious local dishes and tasty natural products, alongside the picturesque churches and small white houses. Cyclades remain top destination for yacht charter due to the explosive nature of alternatives that can offer in such a close range of geographical area. With maximum 3 to 5 hours per day cruising, you can visit in Cyclades 8 to 10 different islands of unique beauty and diversity. It feels like you travel in different countries rather than in the Greek islands alone. There are approximately 220 islands in the Cyclades complex, here in MW charters, we are happy to assist you & create your own personal tailor made itinerary that much your personality & needs. We know the islands very well so as to guide you, surprise you and often to astonish you. Do not hesitate to contact us for more information, we are always happy to assist you further. Cruise in Cyclades in luxury & Style with MedWaves selection of yachts.